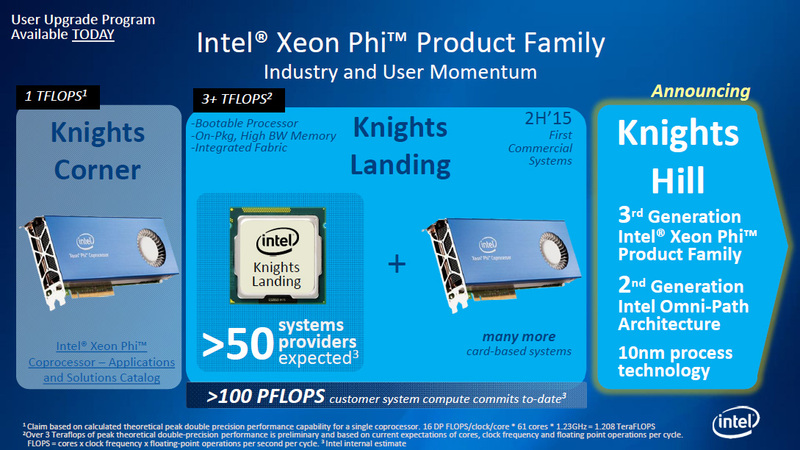 Intel's upcoming Xeon Phi chip, code-named Knights Landing, looks to be an impressive piece of silicon. This development signals that Intel takes the high-performance computing market seriously. Intel (NASDAQ:INTC) has been talking about its upcoming Knights Landing chip, aimed at high-performance computing workloads, for quite some time. Knights Landing is the next in a family of chips aimed at delivering very high performance in workloads that can be effectively parallelized. According to various press reports, Intel says the chip will deliver in excess of three teraflops ("teraflop" stands for trillion floating point operations per second) of double-precision floating point performance, and six teraflops of single-precision floating point performance. Intel has also made it clear that the Knights Landing chip can function as a stand-alone processor with -- according to the chip's chief engineer in a statement to The Platform -- "pretty respectable" per-thread performance. I believe that "technical computing," as it's referred to in this slide, encompasses Intel's high-performance computing-oriented platform sales. Technical computing makes up a significant portion of the company's data-center revenues today, and it's expected to be a very fast-growing segment through 2018. Although the bulk of the revenue that Intel generates from high-performance computing comes from selling its standard Xeon processors, Intel apparently views the opportunity as important enough to develop a very complex custom chip architecture for high-performance computing. Intel says Knights Landing will come in three variants. The first will be as a version mounted on an add-in board. In this case, Knights Landing plugs in to a traditional server and acts as a co-processor. However, the other two variants will come as stand-alone processors, with the difference between them being whether the company's Omni-Path interconnect fabric is integrated onto the chip. According to a slide that Intel showed at the International Supercomputing Conference last year, Intel expects more than 50 system providers to sell systems with Knights Landing as a stand-alone CPU. It also said to expect "many more card-based systems." Once Knights Landing has been in the market for a while, I'd be very interested to see what the relative mix between stand-alone Knights Landing chips and co-processor cards looks like. Intel has said that the next-generation Xeon Phi chip is known as Knights Hill, but it hasn't given too many details beyond that. We do know that it will be built on Intel's 10-nanometer technology, which should allow the company to cram in substantially more compute cores, which themselves should also get faster. And since Intel is positioning the Knights Family as stand-alone processors, I expect that in addition to a large boost in raw computing performance, Intel will make another large leap in single-threaded application performance. If so, it could further strengthen the value proposition of the Knights chips as stand-alone processors that can be sold in place of standard Xeon processors for certain workloads. At any rate, I'm excited to see how big of a role the Knights family of chips, both in stand-alone form and co-processor form, winds up playing for Intel's data-center group down the line.